How to Clean Your Storage Unit Floor! Clean your Storage Unit Floor in Just 4 Easy Steps! You may decide to clean your storage unit floors for a number of reasons. 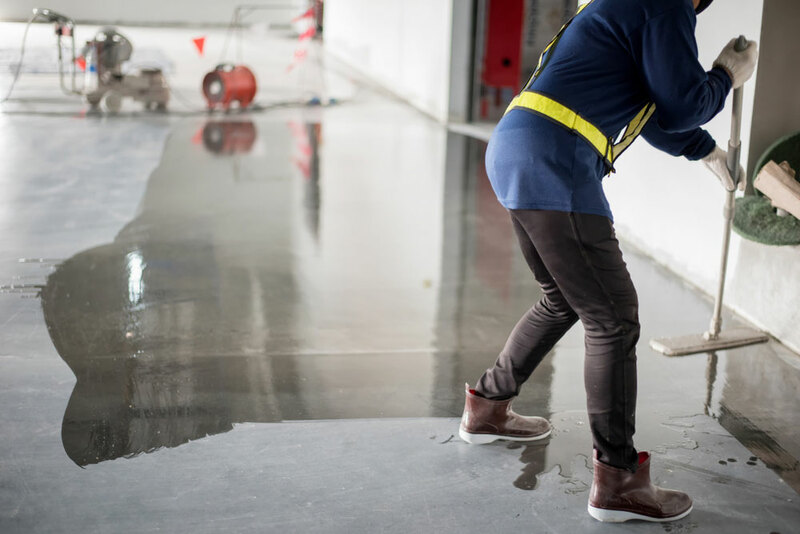 From noticeable stains to general cleaning and upkeep, it becomes necessary to scrub your concrete floors clean every once in a while. The best time to clean your storage unit concrete floors is before you load your belongings inside, or when you’re planning on decluttering. Here’s a step by step guide from Affordable Family Storage on how to properly clean your unit’s concrete floors. Enjoy! Cleaning your storage unit floors doesn’t require a ton of expensive materials. All you need is a concentrated concrete degreaser, a water source, and a sturdy deck brush. A nearby hardware store should have your degreaser and deck brush. Look for a brush with short bristles to really help attack an area when you apply pressure. Too long of bristles may increase the surface area of cleaning but decrease the amount of pressure you can effectively apply to your storage unit floor. Follow the instructions on the bottle of degreaser to properly create the right ratio of water/chemicals. For this, you’ll need access to a nearby water source. Some facilities offer water hookups near units, but in most cases, you’ll have to bring your own water supply to your storage unit. Mix the concentrated cleaning agent with water and apply to the concrete! Now, if your concrete floors have some sort of coating or sealant on them, they’re still easy to clean! Simply find a cleaning agent with less harsh chemicals than your typical degreaser. Because of that protective coating, oils and stains haven’t been able to sink in and your storage unit mostly contains surface-level dirt. Once the solution has been mixed and applied, you can start scrubbing! Start in small sections at the back corners of your unit and work your way out backward. Play some music or bring someone else along to make a dull experience a little more interesting. Dirt and oil can really become embedded into storage unit floors because of the concrete’s porosity. For especially tough stains, it’s best to break out the power washer. The severe pressure of the water can save time and muscle and really get those tough stains out. If you decide to take this route, just remember to pre-soak your floors with a cleaning solution first! The final step in this process is to rinse the suds away! If you brought your own water reserve, start in the back of your storage unit and work your way out with buckets of water. A great tool to aid with this process is a floor squeegee or an old push broom to get excess water out quickly. Then leave your unit door open to air dry before locking up or loading your belongings back inside. Every once in a while, you just really need to scrub your storage unit floors. Luckily, if you follow the steps above it’s not a difficult process and can be completed in half an hour! For more helpful storage unit tips and suggestions, follow the Affordable Family Storage blog right here, or check out our website to view our many locations and facilities!